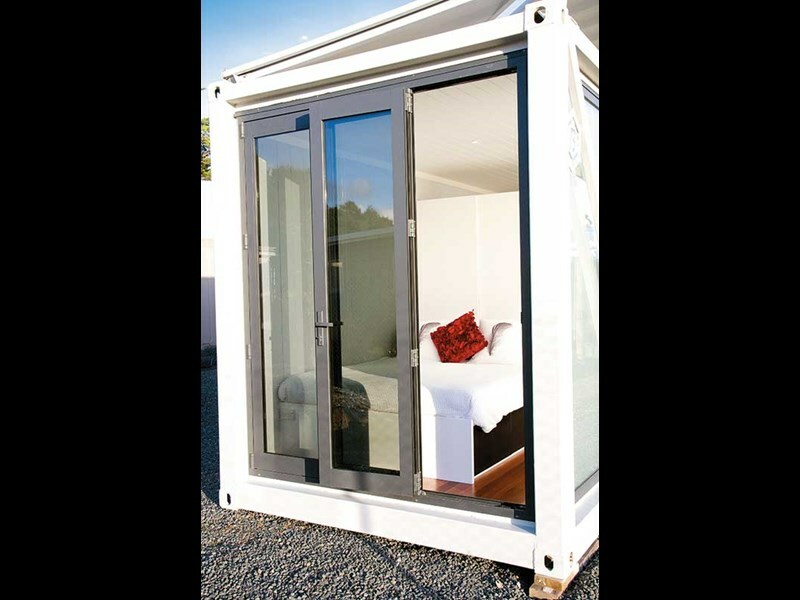 Bill Savidan reckons he’s found the answer for a durable, cost-effective solution where transportable accommodation is required. 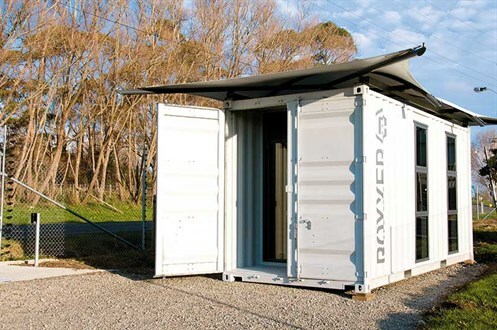 Boxxer is a new venture that builds container accommodation units. 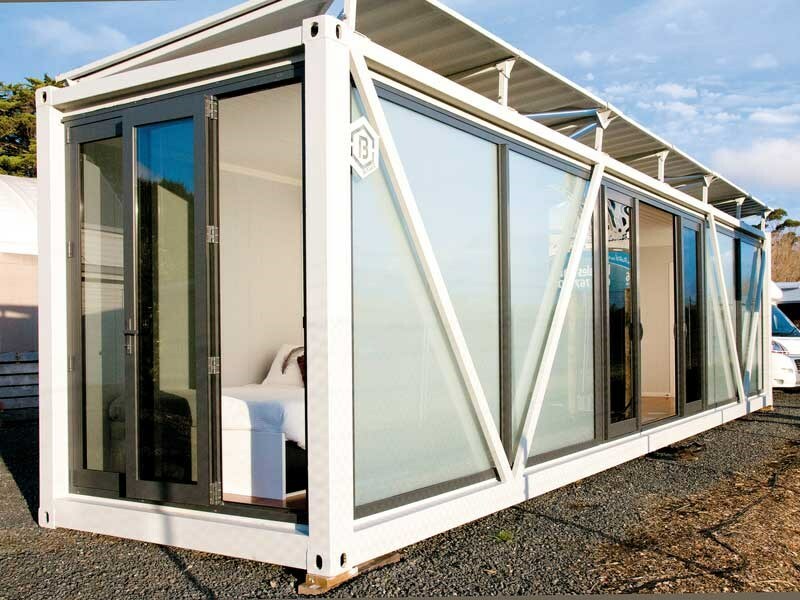 These units take advantage of the durability and ease of transportation offered by using shipping containers as the basic structure. Container durability is legendary; when lost at sea they float for months. In Christchurch, Boxxer containers have been used to create a temporary shopping mall as well as protecting the Sumner Beach road users from rock falls. They are extremely strong structures and even when heavily modified are still able to comply with council engineering requirements for accommodation units. Standard containers are still denominated in the old imperial length measurements – 20 feet or 40 feet. Paul Cook and his sales team at RnRV in Silverdale near Auckland have both sizes on display. The 20-foot units have awning windows and doors installed, are fitted with flooring, and the walls and ceilings are lined with plywood. You have a choice of entry styles. On one, the container doors at the end are replaced with a heavy-duty ranch-slider door. On the other, the container doors remain and the glass end with a hinged door in it is set back a metre or so creating a shallow porch when the container doors are open. The porch provides some shelter from wind and rain and a place to store the BBQ and outdoor furniture when you lock up and leave. The 40-foot units are more creatively modified. On one side the ribbed steel is removed and replaced with full height aluminium joinery. A steel frame with striking ‘V’ braces stiffens the structure in place of the steel that was removed. The two glass panels at either end are frosted for privacy and between them is a large ranch-slider unit that serves as the main doorway. The unit displayed at RnRV has optional ‘glass ends’. As you can imagine, it is very light and bright inside the unit. You enter where the kitchen joins the lounge. To the left is the lounge and beyond that is the bedroom. To the right, the kitchen with the bathroom further right again. 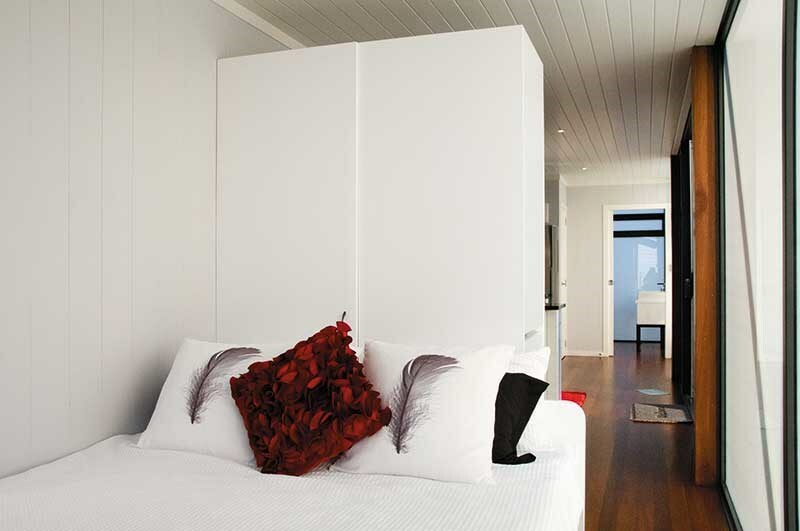 Size-wise, the bedroom is approximately 2.5m, the lounge 2.5m, the kitchen 5m, and the bathroom 2m. All spaces are the internal width of the container, say 2.3m. My first impression was the whole concept had been executed very thoughtfully. The bedroom was small but workable. The display unit had glass ends so the queen-sized bed on its solid base was placed lengthwise against the sidewall with the head against a storage unit that divides the bedroom from the lounge. A hanging locker and four drawers are accessible at the end of the divider unit. The built-in settee in the lounge has deep foam cushions upholstered with piped cushions in black and white patterned fabric and bright red loose cushions for cheerful contrast. Being 5m long, it could accommodate many small children or two adults overnight. 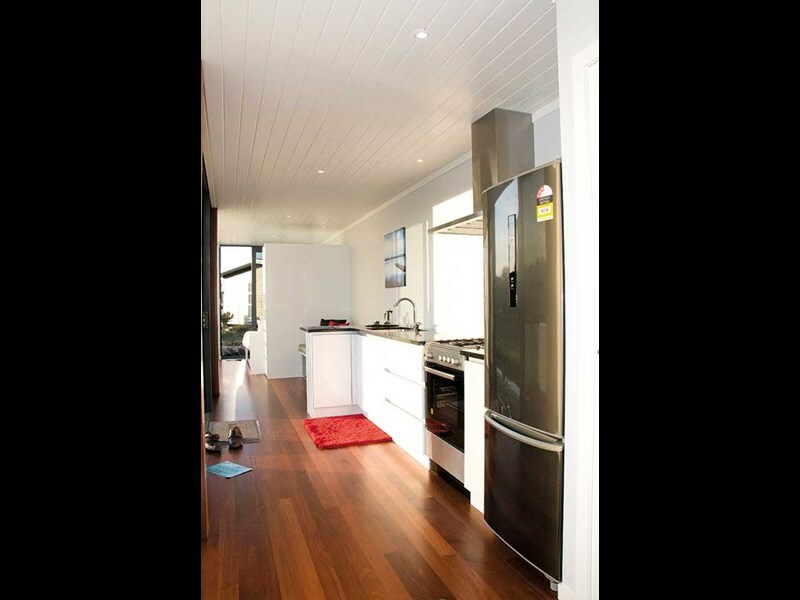 At the heart of the unit is the kitchen, galley-style along one wall. An L-shaped bench houses a large under sink cupboard with a heavy-duty floor; it is sheathed with stainless steel. To one side are three long, deep drawers with a cupboard on the other side. 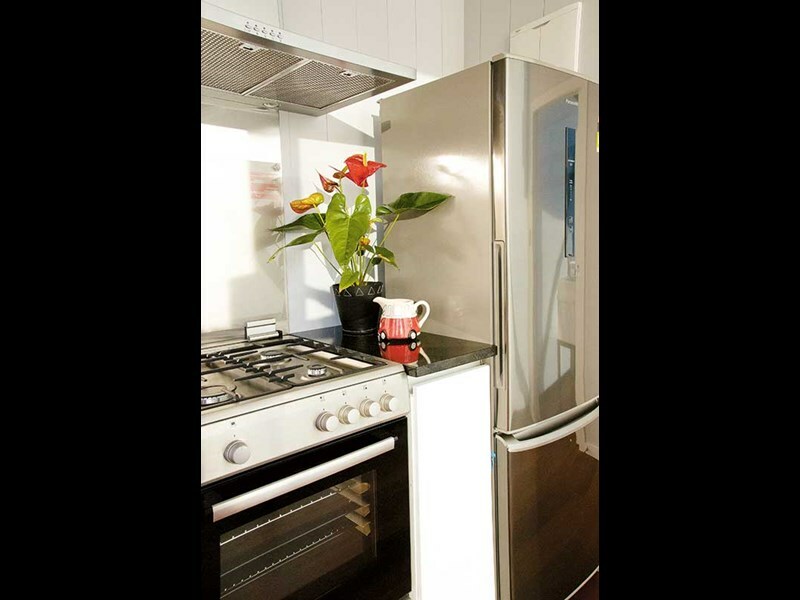 To the right of the bench is a free-standing gas oven with an impressive extractor hood above it, while alongside the oven is a pullout pantry and then a full height fridge freezer. At the end of the unit is the bathroom. 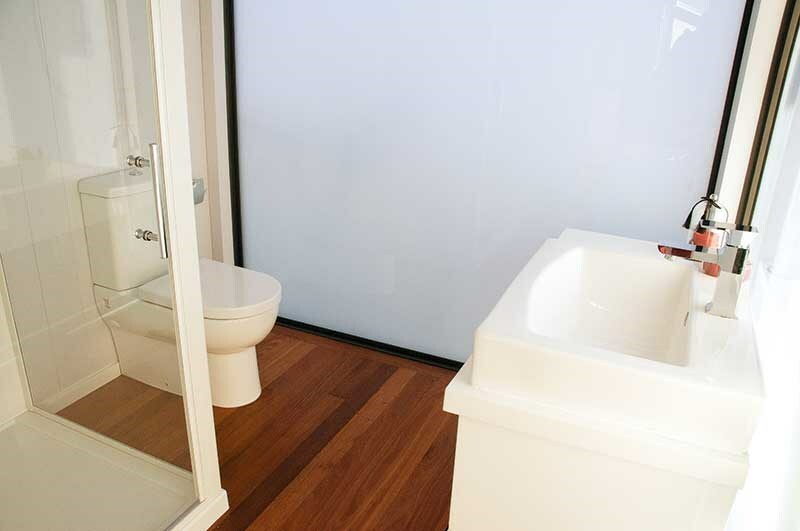 Modern in style with a simple layout and plenty of room, it is the functional approach to ablutions I like. It has a full-sized glass walled corner shower opposite a plain vanity unit with black and white lacquer finish that matches other cabinetry in the unit. On closer examination I was reassured by the overall quality of the fittings used and the workmanship standards I had seen. All the joints were tight and square with a good standard of paint finish. The ceiling throughout is shadow line housing recessed LED down lights. The wall finish is vertical planking and the floor a wooden overlay simulating matai tongue and groove. Other hardwood floor options are available. You can offer buyers the best transportable accommodation in the world, but if it is too difficult to gain council approval to put them on site, you are not going to sell very many. Boxxer is well aware of this. By building them to Code of Compliance standard, Boxxer simplifies the process of obtaining a local body building permit. Resource management and site engineering approvals are still required, just the same as for any other building. 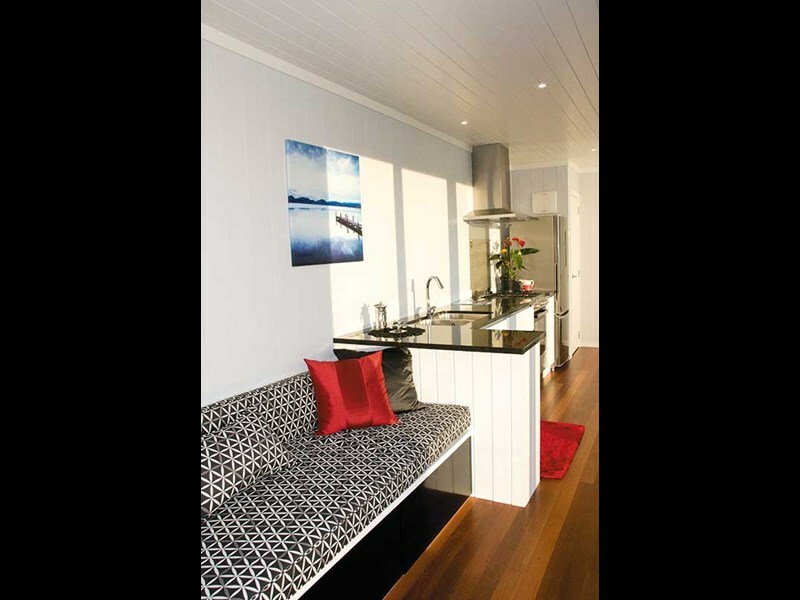 There are a growing number of transportable accommodation units arriving on the New Zealand Market. With its quality finish, stylish looks, the Boxxer and its transportation and site placement advantages should make its mark in this competitive market. It could suit as an accommodation unit for those RV’ers who spend a lot of the year on the road and want a small base to which they can retreat. For more information, call (09) 426 7679. The quality of the appointments and finish. Excellent transportability and site placement. The appearance: rugged, industrial, utilitarian. Narrow width. It would be interesting to see the units joined side by side. Check out the full article in issue #133 of Motorhomes Caravans & Destinations magazine (on sale now!). Subscribe here.